Of the ocean I hadn't the heart to ask how long, how far, to what end. It was a different fear this time that wouldn't let me go near the water. Federal EPA Officials inaugurated the Harwich No Discharge Area August 19th, 1998. Click sign to read story. Heinz Proft photo. Pristine clean handicap accessible restrooms open on a 24 hour a day basis in season are also key to the operation of a wildly successful NDA. Tom Leach photo. Harwich Port, will become a Federal No-Discharge Area under Section 312 of the Federal Clean Water Act (CWA) and subsequent Environmental Protection Agency (EPA) regulations (40 CFR Part 130) in August 1998. Until then the Board of Selectmen have voted the entire area as a voluntary no discharge zone (1995). The Harbormaster and the Marine Water Quality Committee have been actively working with Massachusetts Coastal Zone Management (MCZM) and EPA officials to enhance a holding tank discharge system that is already available to boaters in Harwich. The following regulations are promulgated by the Harbormaster’s Office for use of the pump-out boat and/or pump-out system. We are here to Pump-You-Out! Requests for service may be made on VHF channel 68 or by calling the Harbormasters Office at 508-430-7532. The Pump-out boat will be available by appointment at Allen Harbor and Wychmere Harbor daily between 10 A.M. and 3:00 P.M.. The Pump-out boat will be available daily at Saquatucket Harbor between 9:30 A.M. and 3:30 P.M. The Pump-out station will be available to all boaters at the Saquatucket Harbor fuel dock (south end) daily between 9:00 A.M. and 5 P.M.
No boats will be pumped out without the owner or his/her designated representative on board; this individual must be able to certify that all holding tank covers have been properly vented to prevent implosion of the holding tank. 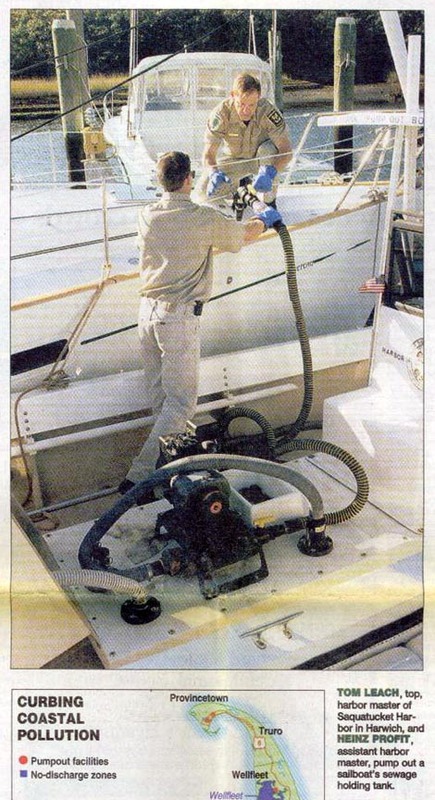 The owner or his/her representative on board during the pump-out service is responsible for seeing that the vessel is properly secured after the pump-out is completed. The owner or his/her representative shall warrant that the holding tank is free of formaldehyde or non-biodegradable holding tank preservatives. The Town of Harwich Harbormaster’s Office and its representatives shall not be responsible for damage to any vessel that results in any way from the rendering of the pump-out service, including but not limited to implosion of any holding tanks. The Harbormaster’s Office provides this service free of charge . Larry Chandler demonstrates the simplicity of the pumpout boat. Pumpout Carts are also provided at marinas, boat yards and yacht clubs in Harwich Port to provide alternative pumpout means when the pumpout boat is not readily available. Like lawn fertilizers and manure, human waste contains nutrients that contibute to algal blooms and oxygen dpeletion. Human waste also contains disease-carrying bacteria which can transmit diseases to swimmers and can cause closure of shellfish beds. For these reasons, it is very important to keep your waste out of the water. Perhaps no other boating issue of recent years has produced as much confusion and irritation as regulations regarding the installation and use of MSD'S (marine sanitation devices). According to Coast Guard regulations, boats are not required to be equipped with a toilet or marine head. However, if a head is installed (portable toilets are not considered installed toilets and are not subject to MSD regulations), it must be equipped with an operable MSD that is built and certified by the Coast Guard to meet Environmental Protection Agency standards. Heads that discharge raw sewage directly over the side are illegal. It is illegal to discharge raw sewage from a vessel into any U.S. territorial water within three miles of shore. In some localities (Harwich) no discharge of any onboard waste is allowed; in other areas discharge of treated waste is allowed, though it should be discharged offshore. The current lack of pumpout facilities hinders compliance with no-discharge laws. A new federal program is making funding available for more shoreside pumpouts, so boat owners should encourage local officials to expedite the process. Copyright © Tom Leach, 1999 Town of Harwich, Massachusetts. All rights reserved. Site maintained by Tom Leach.